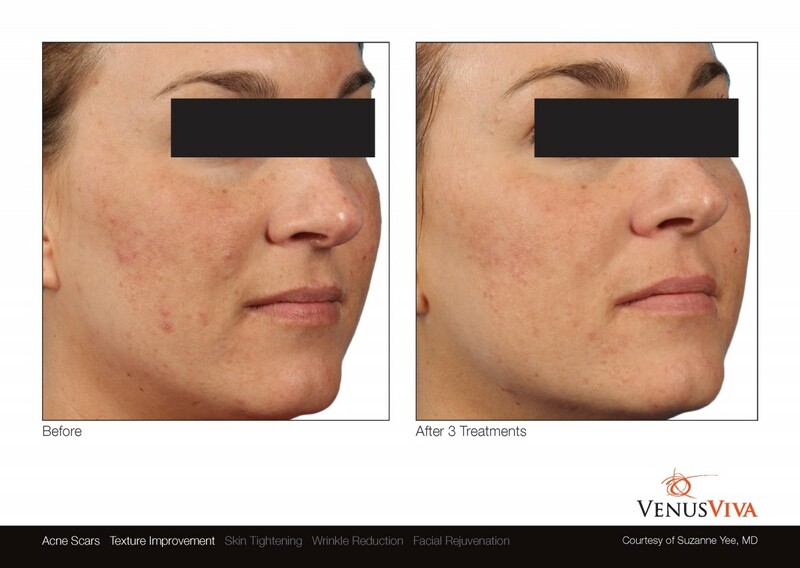 Venus Viva™ skin resurfacing treatments work with tiny pins that safely deliver heat (via Nano Fractional Radio Frequency) through the skin’s surface. This creates tiny micro-dermal wounds, which the body naturally heals on its own. 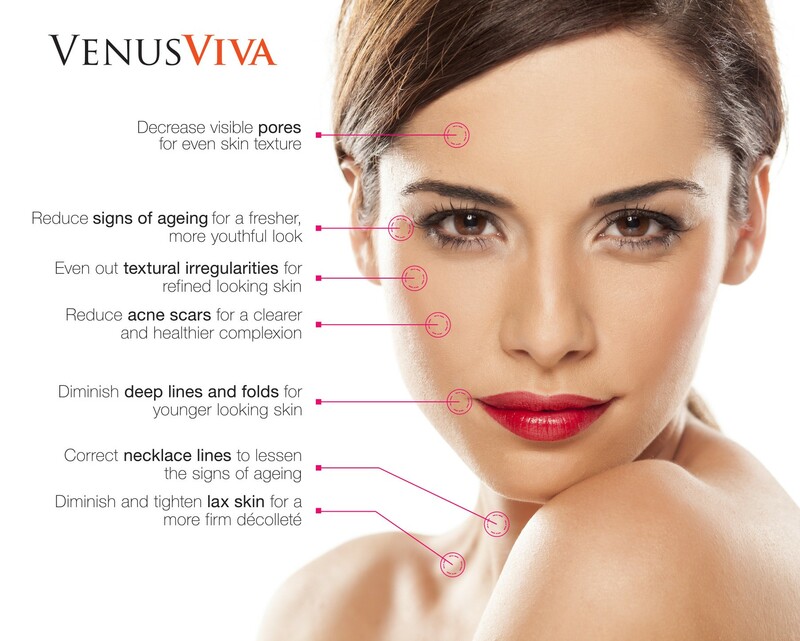 This process repairs signs of skin damage visible on the surface of the skin. 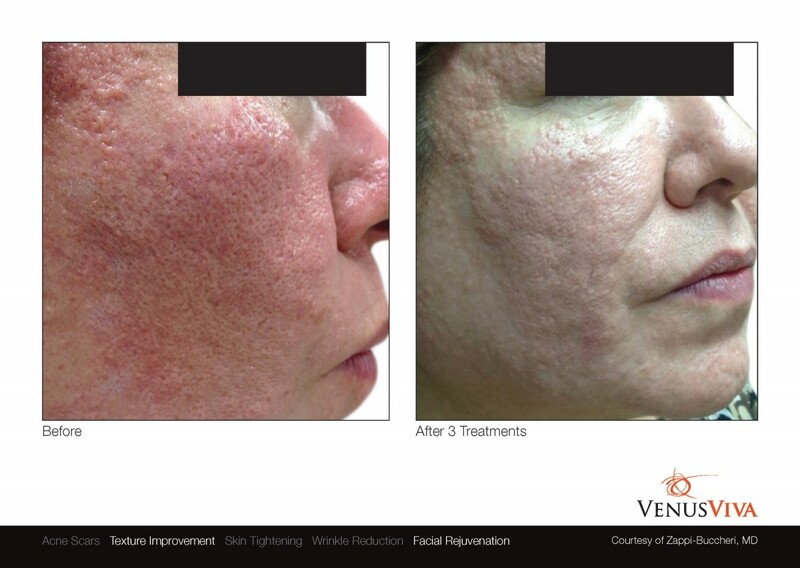 Since the wounds are so small, the treatment is much more comfortable than traditional CO2 lasers, while still producing incredibly visible results. Your treatment provider may also enhance your treatment plan with the Diamond Polar™ applicator, which works to further diminish lines and wrinkles. The Diamond Polar™ applicator uses Multi-Polar Radio Frequency and Pulsed Electro Magnetic Fields to produce uniform heat under the skin’s surface. 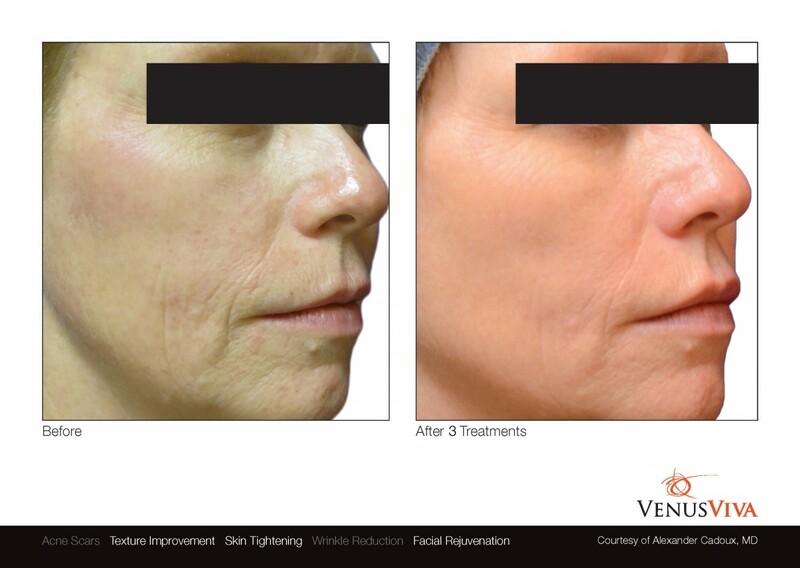 This process helps to naturally increase collagen and elastin fibers, resulting in smoother, firmer skin that looks noticeably more youthful. Does this treatment work for me? The ideal candidate is anyone who shows signs of skin damage, including deep wrinkles, scars, visible pores, stretch marks, and/or anything else that affects the skin’s texture. You will feel tiny pins on your skin followed by a little zap. Your face will then feel warm, like a sunburn. Yes, but only for 24 hours’ post-treatment (or up to 5 days for more aggressive treatments), unlike lasers or other treatments where recovery or downtime lasts up to 10 days. Your skin will be red and for the first 24 hours, you will not be allowed to apply or rub anything on your skin, including water or sweat (so no hot yoga or any other exercise that will make you perspire). After 24 hours, you may put on makeup and resume your regular skincare routine. You should apply sunscreen (at least SPF 30), preferably one without chemicals. But avoid rigorous exercise and hot baths or massages on the treatment area for the first 2 days after your session. Make sure to keep your skin clean and protected from the sun. Avoid any sort of tanning. If your skin feels hot, you can use a fan to cool it down. Avoid touching or scratching the treatment area. Do not put lotion, makeup, or anything else on your skin, including water, for 24 hours. After 24 hours, you should apply sunscreen (at least SPF 30), preferably one without chemicals. Also, avoid rigorous exercise and hot baths or massages on the treatment area for the first 2 days after your session. Make sure to keep your skin clean and protected from the sun. Avoid any sort of tanning.